Sharan B. Merriam is professor of adult education at the University of Georgia. Merriam's research and writing activities have focused on the foundations of adult education, adult learning, adult development, and qualitative research methods. She has won the Cyril O. Houle Award for Outstanding Literature in Adult Education for three books, including one for Learning in Adulthood. Rosemary S. Caffarella is professor and chair of the Department of Education in the College of Agriculture and Life Science at Cornell University. Her research and writing activities have focused on adult development and learning, program planning and evaluation, and leadership development. She has authored or coauthored a number of books, including the award- winning Learning in Adulthood. Lisa M. Baumgartner is an associate professor of adult education at Northern Illinois University, DeKalb. Her research and writing focus on adult learning and development and women's contributions to the field of adult education. She is a recipient of the W.K. Kellogg Foundation's Cyril O. Houle Scholars Research Grant for Emerging Scholars in Adult Education. PART ONE: ADULT LEARNING IN CONTEMPORARY SOCIETY. 1 The Social Context of Adult Learning. 2 Learning Environments and Learning Concepts. 3 Adult Learners: Who Participates and Why. PART TWO: ADULT LEARNING THEORY AND MODELS. 4 Knowles’s Andragogy, and Models of Adult Learning by McClusky, Illeris, and Jarvis. PART THREE: NEWER APPROACHES TO ADULT LEARNING. 8 Embodied, Spiritual, and Narrative Learning. 9 Learning and Knowing: Non-Western Perspectives. 10 Critical Theory, Postmodern, and Feminist Perspectives. PART FOUR: LEARNING AND DEVELOPMENT. 13 Cognitive Development in Adulthood. 15 Memory, Cognition, and the Brain. 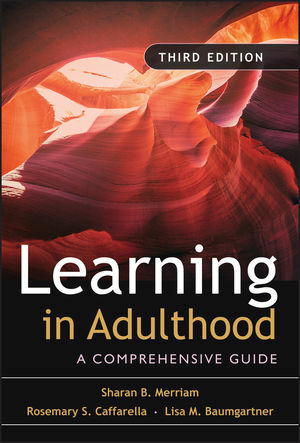 16 Reflections on Learning in Adulthood.